Book Description: In 1980 Elaine Harvey worked for the International Red Cross in the Cambodian refugee camps immediately after the fall of the brutal Khmer Rouge regime. Nearly three decades later Elaine returns. She meets the people on the front lines – the human rights activists, the caregivers, and those who needed care, inspiring her to explore the challenges of service. Additional Book Titles: Writing my second book – a travel memoir. The title is pending. 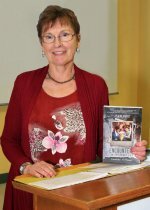 Author bio: Elaine Harvey is a retired nurse, a writer, and a traveler. A diverse career and her adventurous spirit have taken her to remote regions of the world – to the deserts of Africa and refugee camps in Asia. Elaine has a BSc. in Nursing from the University of Victoria. Encounters on the Front Line, Cambodia: A Memoir is Elaine’s first book of creative non-fiction. Professional Speaker Topics: Cambodia with book reading presentation.